Beautiful Hoi An is not just a random city in Vietnam. It is also a UNESCO World Heritage Site. This marvelous place was originally a trading port, dating all the way back to the 15th century. Since it received many imports, its architecture has taken characteristics from many cultures, including the Indian, the Dutch, the Chinese and even French. For backpackers who’re on a budget, it is recommended to stay in a hostel. Hostels in Hoi An range from 200,000 to 300,000 VND per bed. If sharing a room with strangers is not a part of the plan, for only 360,000 VND and upwards, private rooms for two can be found. The Sac Lo Homestay & Hostel is a good option. While it’s away from the city noise, it’s still walking distance to different attractions. For a step-up from a hostel, the Loc Phat Hoi An Homestay-Villa, which is really a hotel, is a good choice. Hoi An is easy to get around, and for lovers of long-walks then there’s nothing to bring but a good pair of shoes. However, there is always the option to rent a bicycle for about 30,000 VND. If a bicycle sounds too slow, or not thrilling enough, there are luckily motorbikes available. Locals and tourists alike love them because they are easy to use, park, and gas, and they’re available for an average of 80,000 VND a day. Having a bike or motorcycle is also fun because it allows for a wider parameter of exploration terrain! Walking around Old Town, along the river, is thrilling in itself, yet a must-see is the Central Market. It is full of food, souvenirs, random finds and smiling locals! The experience in itself is free–and whatever’s for sale is usually up for a fair price. Locals will also be bartering and animatedly making business, so for those who love people-watching, or even photographing, this is a place to be! Visiting Quan Cong Temple is another fun activity, especially for architecture lovers, who will appreciate the intricate woodwork found within. 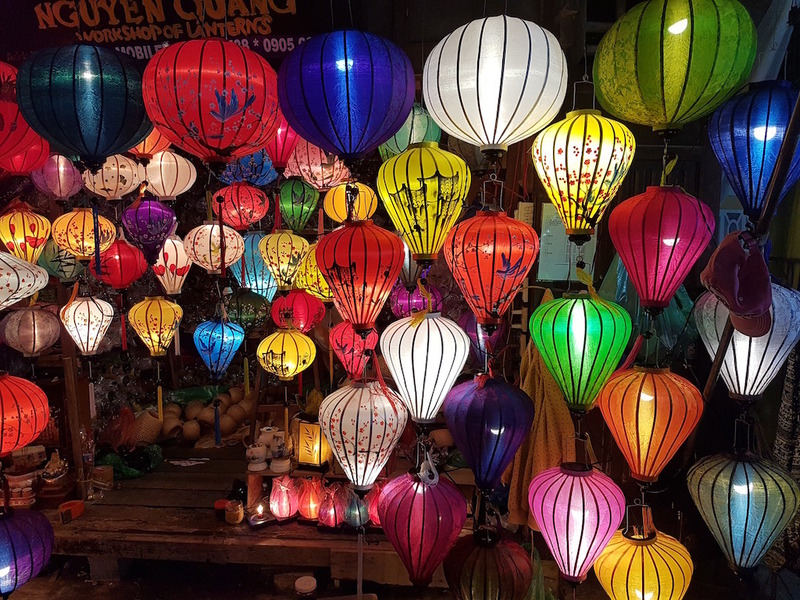 While it is a sacred site and holds spiritual value, it attracts tourists for its beauty, so people in Hoi An are sure to pay a visit. Another great thing in Hoi An is the tailoring. That’s right– Hoi An is oddly known for its cheap and top-quality tailors. There is an endless amount of local clothes-makers who will take any tourist that allows it and measure them up and make them an incredible garment. For all those who like to dress well, this is a heaven. What tourists pay here is only a fraction of what handmade suits cost in the U.S. and U.K.
To cap off a great day in Hoi An, bars are always a solid option. Spread through the city, and brimming with beer, they’re good places to meet other travelers and share stories about the lovely pastime of traveling. Hoi An certainly has many attractions, all perfectly fit for any sort of backpacker.